NEMA 4X rated computer enclosures are the perfect solution for a washdown environment. Computers, monitors, printers, and keyboards are an absolute must for product manufacturers, especially when it comes to automating the company’s processes. For computers to be operative in industrial settings, they are often placed in a dirty factory or plant environment, which means that they will most likely fail if exposed to harmful contaminants. Installing a NEMA 4X enclosure cabinet - to house a computer and electronics - will keep the system working for many years to come. During the manufacturing process, the food and beverage industries must adhere to strict guidelines regarding product safety and contamination . Industrial plants and factories must ensure that all machinery, including computer enclosures, are regularly cleaned and contaminant-free. The washdown procedure removes residue and waste materials to preserve the highest food and beverage quality. Condensation occurs when warm, moist air comes into contact with a surface that is colder than the air’s dew point. Why is condensation important in relation to computer enclosures? Humid conditions cause warmer air to hold more water vapor. If warm air on the inside of an enclosure comes into contact with a colder enclosure body, it will cool - leading to water or condensation. Why is condensation bad for a computer enclosure? A build-up of condensation may lead to a failure of expensive, internal electronics causing a product replacement and costly downtime. Will Self Order Kiosks Replace a Face Behind the QSR Counter? Deploying high-bright digital menu displays with enclosures takes research and strategizing. Static menu boards, at the drive-thru, are not as prevalent as they once were, as Quick Service Restaurants (QSRs) revamp their strategy to include digital signage solutions (both outdoors and indoors). As technology improves, restaurants are adding innovative, easy-to-update digital displays (with all-weather enclosures) to present eye-catching animations and videos. Outdoor digital menu boards make it simple for a restaurant to change prices, promote special food items or drinks, remove a sold-out product, boost sales, improve overall service, and increase the restaurant’s brand. Several factors must be considered when researching outdoor digital menu boards, including trustworthiness, how easy is it to use, and can the digital boards achieve long-term sales goals? Government work can be very lucrative for a business. In our line of work, we receive requests from the digital signage industry (city improvement projects, transportation authorities) as well as the industrial sector (waste water treatment plants, military). Installing electronics outdoors, in a sealed computer enclosure, will present a series of challenges. If the proper thermal management is not maintained on the inside of an enclosure cabinet, humidity and high temperatures will pose serious threats to electronics. It is imperative that the enclosure provides a suitable operating environment – thus helping to extend the lifetime of the electronics. Looking for a desktop computer enclosure that can house a widescreen monitor (up to 24"), keyboard, mouse, and computer? 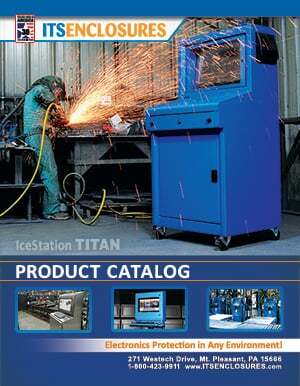 Introducing the NEMA 12 IceStation Desktop TITAN by ITSENCLOSURES!